BW photo. Gisborne Street - looking south. 1913-1914. Probably taken from the Melbourne Fire Brigade lookout tower. 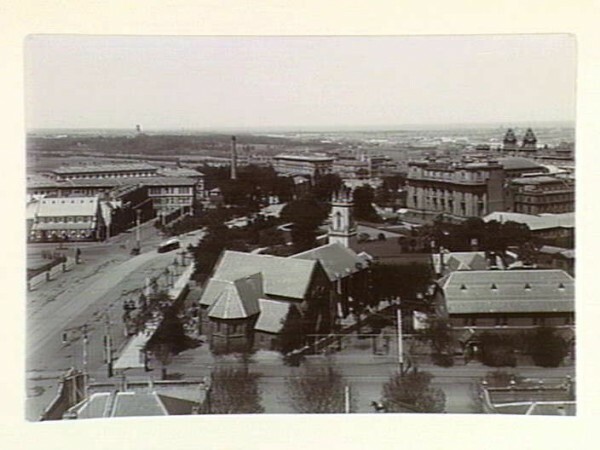 St Peter's Church, on the corner of Gisborne and Albert Streets, is in the immediate foreground. Description: photograph : albumen silver ; 11.7 x 17.1 cm. Contents/Summary: Showing rear of St. Peter's Eastern Hill; overlooking State Government Offices and Parliament House. Related works: Series: Street scenes of Melbourne.